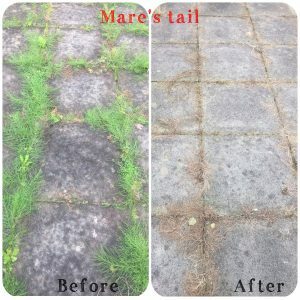 Some people are happy for dandelions and daisies to grow in their lawns, but are understandably less happy about these weeds taking hold in their newly laid mono-block driveway, or their gravel path or patio. This is where Clear Space Weed Control comes in. Clear Space Weed Control is the business name for the weed control side of our business. No garden is ever weed free. Weed seeds lie dormant in all gardens. They are waiting for the right conditions to germinate – they need water, warmth and light, that’s all. Many weed seeds are blown in from the local area, dropped by birds, or spread by existing weeds that have seeded nearby. Controlling weeds is therefore a continual and ongoing process. It doesn’t take long for weeds to take hold in a garden. Before too long the walk along your path up to your front door can begin to look unsightly and unkept, spoiling what could be a pleasant area for planting with shrubs or colourful bedding plants. In some situations, for example where weeds are in a soil border along a path such as in the photo on the right, the weeds can be removed by hand using a hoe, trowel or fork. 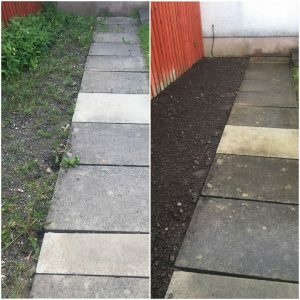 However, they’ll also be times when hand weeding isn’t possible, for example when weeds are growing in-between the gaps in paving, or when weeds are spread within a stone chipped area. 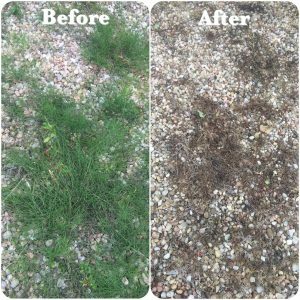 If you do have weeds growing in your driveway, path, patio, stone chipped or landscaped areas in your garden then Clear Space Weed Control can provide a range of chemical options to kill those invasive weeds down to the root of the plant. The weed is then dead, it does not grow back. 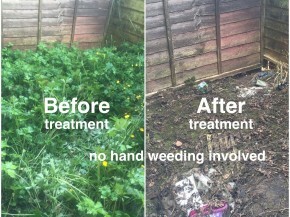 Clear Space Weed Control can assist you with killing a range of weeds, with a range of different products. We have slow and fast acting weed killer products; weed killing products specific for certain types of weeds such as mare’s tail; and weed killing products that can be used around trees and shrubs. We also have weed killing products that disintegrate and become inactive in the soil, and other products that stay active in the soil for a period of time to prevent weeds from taking hold. Please contact us to discuss your weed control needs. Click the relevant icon below to be directed to the CLEAR SPACE WEED CONTROL social media channel you would like to view.